Shiraz (or Syrah), a dry, full-bodied red wine with ranging expressions from red to dark fruits, usually with medium to high tannins (depending on climate and production), is one of my favourite wines. As complex wines, these usually do best paired with food. In particular, this is true of cool-climate Victorian Shiraz, which is usually quite dry with a beautiful balance of dark fruits, spice, tannins and even smoke. Victoria produces some of Australia’s (and the world’s!) 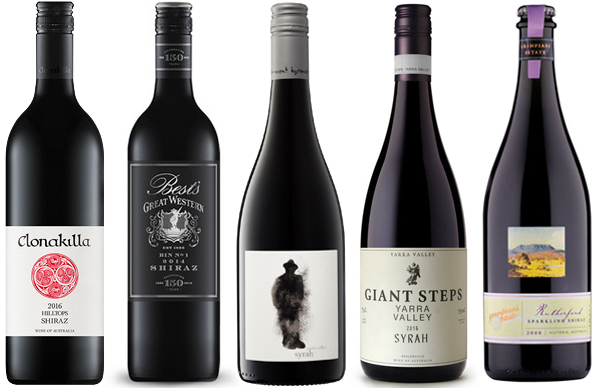 greatest Shiraz, many of which are well-worth their hefty price tag. As with any wine, there are plenty of lower end bottles that leave much to be desired, but I have found a few real gems that won’t break the bank. All under $35, below are my top 5 Victorian Shiraz. Clonakilla makes some of my absolute favourite Shiraz. This one is an absolute bargain – made on their Hilltops site in southwestern NSW, this slightly warmer vintage offers the perfect union of rich black fruits, subtle spice and deep flavours. This Grampian’s winery produces some outstanding wines, but their Shiraz takes the cake. The Bin 0 Shiraz is a bit pricier, but this guy is still embodies The Best’s approach to winemaking and their unique expression of the Great Western region. Classic cool climate with spice and pepper, but not too big – a good one for simple but comforting weeknight meals. As we’ve learned, Syrah is the same thing as Shiraz in modern-day winemaking. Innocent Bystander’s reference to the traditionally named French grape is reflected in this wine’s finesse – not overly fruity and big, but rather earthy, peppery and spicy – almost rustic – but still sophisticated. Another steal at $25/bottle. Syrah, again. Grapes used in this affordable choice from Giant Steps are handpicked from their Tarraford and Sexton vineyards in the Yarra Valley. There is a focus on minimal intervention and natural processes, as to let the characteristics of the region shine. A beautiful play of spice, cherry, herbs and mellow tannins. Yes, a sparkling Shiraz! If you’ve dabbled in Lambrusco, you’ll know that sparkling reds can be a wonderful thing. This one from Grampians Estate is rich in berries with just the right amount of spice, sweetness and tannins – all with just a hint of fizz on top. A perfect one to enjoy at long summer lunches or cocktail parties – it’s the perfect, relaxed matched for sophisticated nibbles like cured meats and cheeses. For more of our top wine picks and regions, check out our blog.